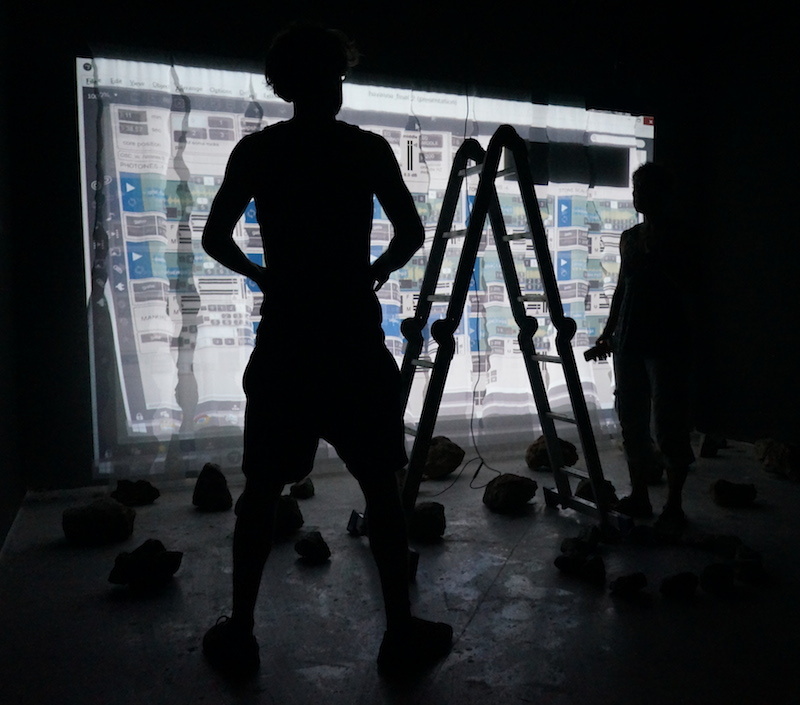 For the projection installation, Origination Point, which was presented at the Havana Biennial, I collaborated with Marcel Schwittlick, a young German visual artist that incorporates programming and technology into his work. We started working together in Berlin just 8 weeks before show time. Check out his website for more about this cool new artist. Apart from his creativity and skill, he demonstrated his ultimate dedication to his work when he climbed in through a window at 1am to get into the exhibit hall to make some final edits to the piece. He almost got arrested if not for Roberto, his Chilean friend who was able to speak in Spanish and explain. Thanks Marcel and Roberto! In his personal work he is examining new possibilities of modern technology. He is interested in digital culture and its inclinations on society and is working in strong connection to various fields in the arts, forging a connection between physical and digital media. He’s experimenting with a variety of media ranging from digital images, physical and interactive installations, videos to physical acrylic paintings. The play with media is a basic property of his work challenging the spectator to see his work outside of the context of one specific media and immerse into the underlying story. This story will often be communicated and transformed with his technological thinking, putting the future onto display. His main objective is to make virtual and digital aspects of life more tangible and emphasize the necessity for critical but open examination of tendencies in this ever changing point in time. For the visual part of the piece, it was essential that a generative approach be chosen. Generative in this context means that the visual output is slightly different every time the application is run, but still within certain boundaries, which I expressed in code. The visuals in it’s entirety are generated in real-time. For developing the software for the piece I used the collaboratively developed creative coding framework OpenFrameworks. OpenFrameworks is not a ‘program’, it’s essentially a set of tools for creating experimental media based applications. 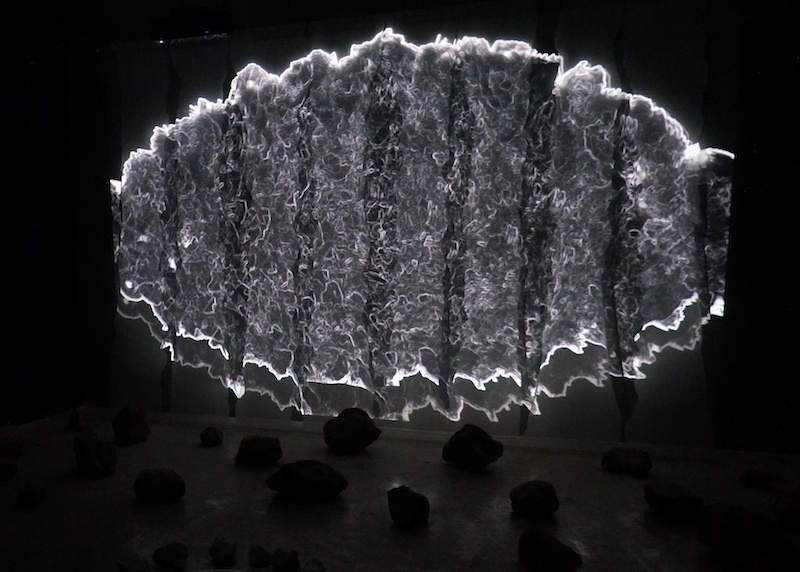 The entire piece is constructed of generative and static elements. The nature of the generative approach is to let the computer have a certain degree of freedom in the creation of the piece. Many of the generative elements in this piece are using Perlin noise (http://en.wikipedia.org/wiki/Perlin_noise) in all it’s varieties. 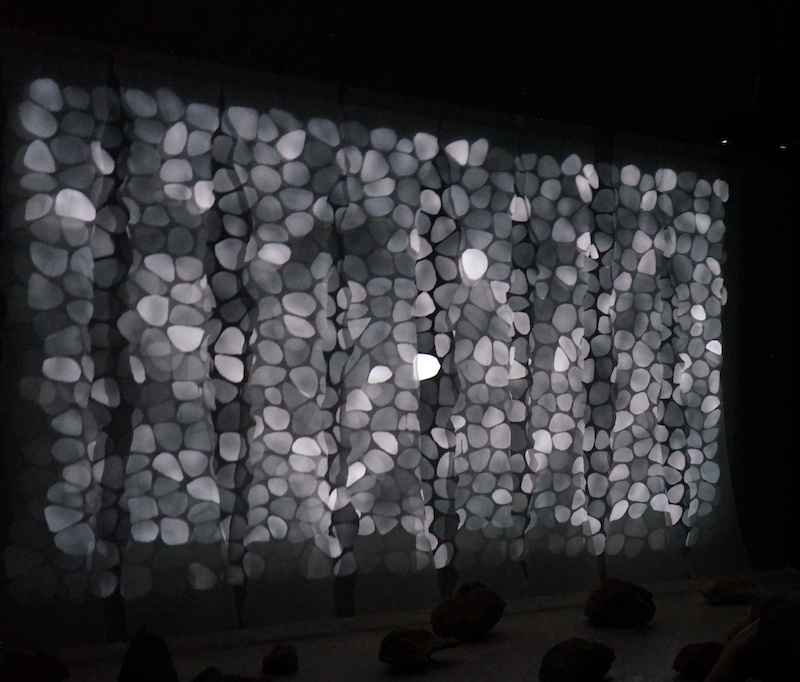 In Act One, the texture of the stone wall is generated with a two-dimension noise field, the shapes and margins between the individual, small rocks are governed by a smoothed voronoi diagram. The vector field is animated in relation to a three-dimensional noise field. The walking stones are animated with the concept of a random walk, which is essentially governed by random, the brother of noise. 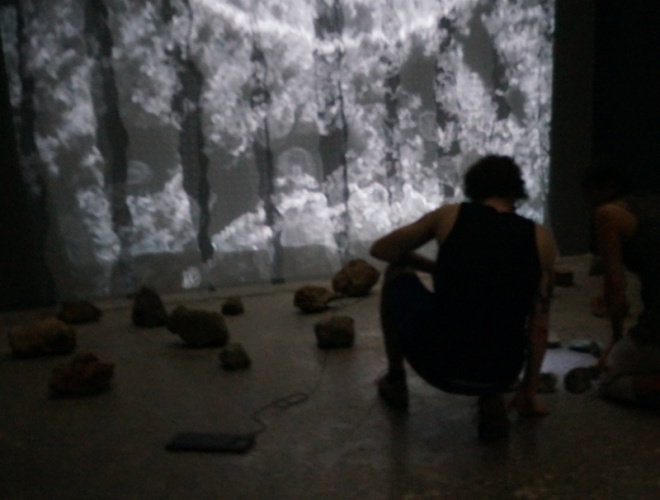 In Act two, the texture of the rock is created via a combination of generative and static elements. In order to create the texture, many image of brush strokes are used, which are arranged randomly in relation to the shape of the rock. The shape of the rock is generated through an underlying voronoi diagram, which is slightly adjusted in order to create a big, organic and centered cell. For act three, all layers that are introduced in this act are variations of the growing rock from Act 2 being layered over each other with different transparencies. Thanks again to my sponsors!